Heat oven to 350°F. Spray large cookie sheet with cooking spray, or line with cooking parchment paper. Place both loaves of dough, seam sides down, on cookie sheet. Join ends of loaves to form 11-inch ring; pinch ends together firmly to seal. Using sharp or serrated knife, cut 12 diagonal slashes (1/2 inch deep) on top of dough. In small bowl, beat egg and 1/2 teaspoon of the oregano with fork; brush generously over dough. Sprinkle dough with Parmesan cheese. Bake 26 to 30 minutes or until deep golden brown. Cool on cookie sheet 20 minutes. Meanwhile, in medium bowl, mix lettuce, onion, tomatoes, oil, vinegar, red pepper flakes and remaining 1/2 teaspoon oregano. Refrigerate about 20 minutes to blend flavors and slightly wilt lettuce. In food processor, cover and process mayonnaise, garlic and avocado until smooth. Cut bread ring in half horizontally. Press inside of top and bottom of ring to flatten bread slightly for fillings. Place lettuce mixture in bottom of ring. 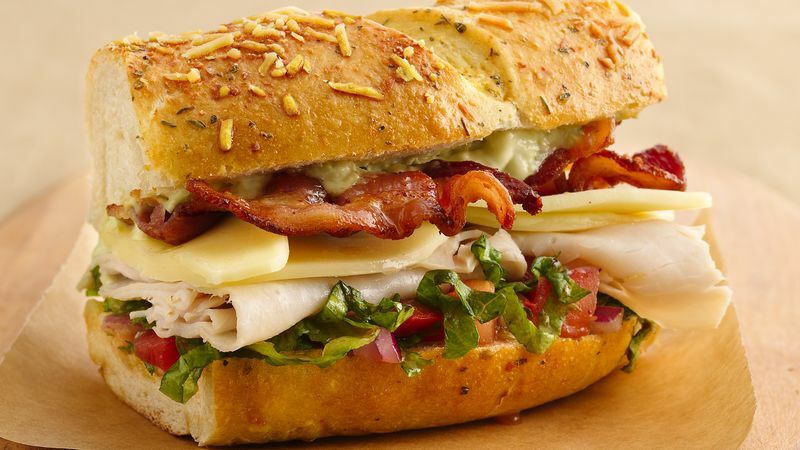 Top with turkey, provolone cheese and bacon. Spread avocado mixture in top of ring; place on bottom ring. Cut into 8 sections to serve.